‘Studios’ magazine featured four Vashon artists and their studios in its Summer edition. 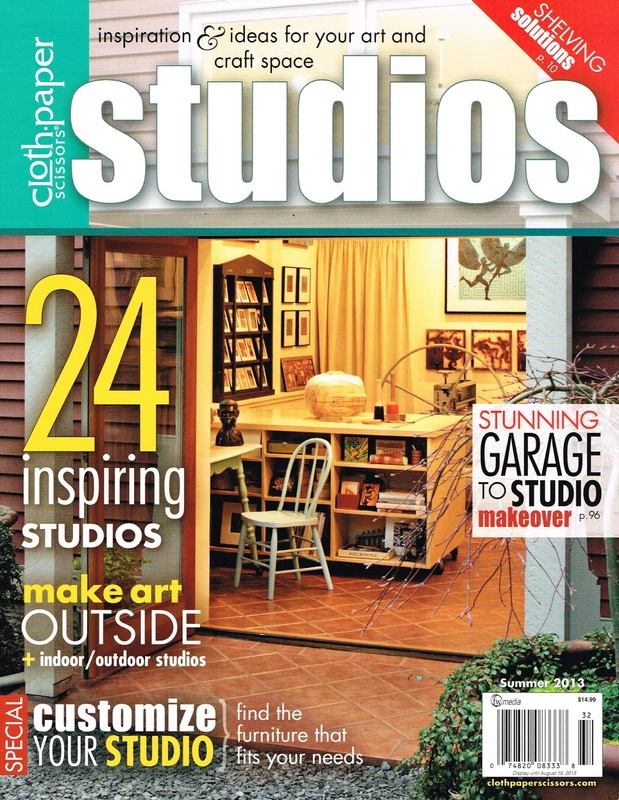 My studio was chosen as the cover. The following is how I describe my present creative space. I am a Print, Paint and Assemblage artist. The images I make have their origin in story. The story may be personally relevant but often falls within the realm of myth. The interpretation of myth and visual exploration of story is informed by and evolves in my approach to Monotype print. I think of Monotype as a lively conversation of knife with paper, ink with plate, and paper and plate with press. The exploration of these simple materials, mediums and tools provide an exciting way to discover imagery that I may subsequently interpret in the more traditional medium of oil on canvas or include as critical components of my assemblage work. In addition to my press work I am currently exploring another Monotype process utilizing mild steel plates that are composed, cut and rusted to muslin. The cut steel provides a designed and predictable matrix while the process of rust and transference by absorption of rust into the muslin is always a surprise and unique visual mystery. My Vashon Island studio and the garden workspace that surrounds it support my exploration of Print, Paint and Assemblage by being well organized and flexible. Custom built furnishings have allowed me to maximize creativity in a somewhat constrained space. 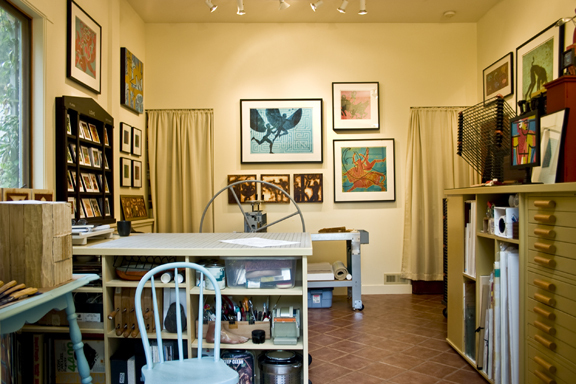 Inside the studio, my press, large and small work surfaces and print drying rack, are all on wheels and positioned as dictated by work or exhibition events. Because this space serves occasionally as a retail space my artwork is always on display and changed as events and space dictate. On the surface of the central table (nicknamed The Barge), I mix ink, cut mats, frame, carve and construct my assemblage work. In its drawers and on its shelves are stored many of the tools necessary for my work. When I’m printing this surface is covered with glass that I remove to perform other tasks. I have constructed additional vertical and horizontal shelves around large flat files. This storage unit is 4’ deep, 8’ long, 4’ high and provides another horizontal work and display surface with a bookcase above it filled with favorite books for easy reference. The flat files are invaluable for holding paper and finished prints while the vertical shelves hold the various plexiglass plates and glass I use when printing as well as full sheets of matt board and foam core for framing and panels used for painting. More storage space behind two draped alcoves keep things at hand but out of sight. I have found that a zinc lined and air tight antique oak refrigerator, also in one of the alcoves, is great for safely storing thinners and flammables. Outside, when weather permits, two 4’ by 8’ tables provide satellite work surfaces. Most of my rust print process I do here to take advantage of open air and sunlight. The tables make an excellent outdoor classroom in the summer months when positioned beneath the cedar trees. My studio is 15’ x 13’ with an 11’ ceiling . Although I hope to build a larger studio someday I could not ask for a more pleasant and light filled space than my present Vashon Island studio.